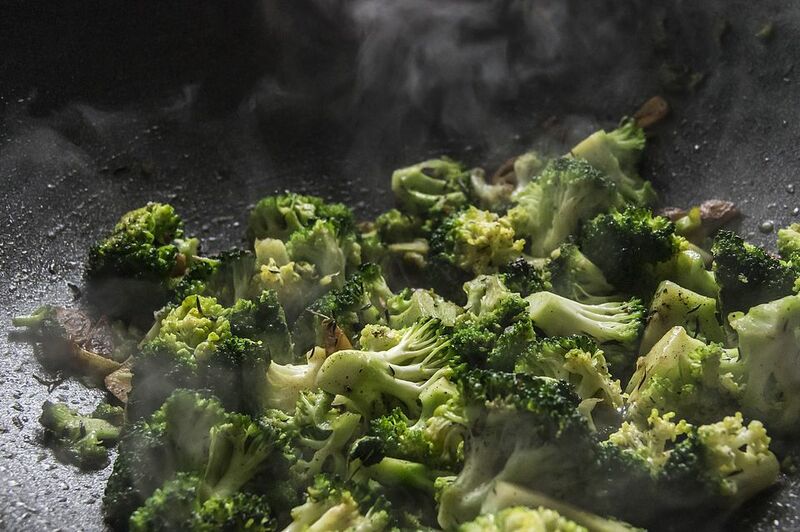 A hardy vegetable loaded with nutritional benefits, broccoli readily absorbs the Asian flavors in this easy stir fry side dish recipe made with fresh garlic and oyster sauce. The key to this recipe is to make sure the broccoli is thoroughly drained before stir-frying and to stir quickly so the garlic doesn't burn. Chop off the hard stems at the bottom of the broccoli. Break off the flowerets and then split them into either halves or quarters. Peel the stems and slice them diagonally into thin slices (about 1/8-inch thick). Cook the broccoli in boiling water for about 3 minutes, until it just begins to soften and become tender but is still crisp. (Be careful not to overcook.) Place in a colander and drain thoroughly. In a small bowl, combine the oyster sauce, chicken broth, Chinese rice wine or dry sherry, and sugar. In a separate small bowl, stir the cornstarch into the water to form a "slurry." Heat the wok. To test to see if the wok is hot enough, add a few drops of water to the pan. If the water starts sizzling immediately, the wok is ready. Add 2 tablespoons peanut or vegetable oil (the sesame oil will be used at the end of the dish) to the heated wok, tilting the wok and moving it back and forth so that the oil goes partway up the sides of the pan. When the oil is hot, add the garlic. (To test and see if the oil is hot enough, add one or two slices of garlic. The oil should immediately start sizzling evenly all around them). Stir for about 10 seconds, then add the broccoli. Stir to mix with the garlic and add the sauce. Reduce the heat to medium, cover the wok and cook for about 30 seconds. Re-stir the cornstarch/water mixture and add it to the wok, stirring to thicken. Stir to mix everything together. Remove the wok from the heat and stir in the sesame oil. Do a taste test and adjust seasonings if desired. Serve immediately.